Coast Powertrain specializes in supplying powertrain parts and components all over the world, for a range of industries such as: construction, mining logging, airport maintenance and material handling. Also, Coast Powertrain provides genuine service parts, complete new or remanufactured components to service your heave-duty equipment. 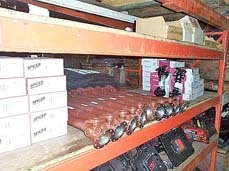 Professionals in the equipment industry staff our extensive parts inventory. Coast Powertrain's focus has been to build and maintain a reputation for quality and integrity in our industry and we are proud of our reputation for service, our facilities and our people. All Products are warranted to be free from defects in material & workmanship. Warranty is limited to the repair or replacement of products failing under normal conditions of utilization, without any other liability on our part including installation and ensuing consequences. Warranty is subject to original manufacturer's authorization, with supporting documentation identifying cause. Coast Powertrain reserves the right in the determination of a warranted labour allowance. All items to be returned must be pre-approved. All items must be new, and in salable condition. Must include the invoice number on which they were purchased. Must include the Return Authorization Number on the package or packing slip. The items must be normally stocked by us at the time of return (not the time of sale). Freight charges must be prepaid. There is no restocking fee or offsetting order required. These requirements are superseded by the Special Order/Special Made Items policy. Items ordered by part number or description, in error, and pulled from our stock are returnable. 15% restocking fee will be charged. Items that are special ordered or special made for you are not returnable. Exception: If the item is stocked by us, you may return it under the Standard Items return policy. Items shipped in error by us are returnable. Item may be shipped freight collect. No restocking fees or offsetting orders are required. Copyright © 2005 Coast Powertrain Ltd. All rights reserved.